UPDATED, March 22, 2:20 p.m.: Developers are banking on rising demand for hotels in Greater Downtown Miami, where the pipeline of new development includes more than 12,000 hotel rooms spread across 43 projects. A new report from the Miami Downtown Development Authority found that the number of rooms planned – nearly 4,000 – and the number of rooms proposed – roughly 8,200 – would lead to more than doubling the existing supply of 8,121 rooms in Brickell, downtown Miami, the Arts & Entertainment District, Edgewater, Midtown, Overtown and Wynwood. Roughly 400 rooms are under construction: a Hotel Indigo in Brickell with 230 rooms, and an AC Hotel by Marriot with 153 rooms in Edgewater. 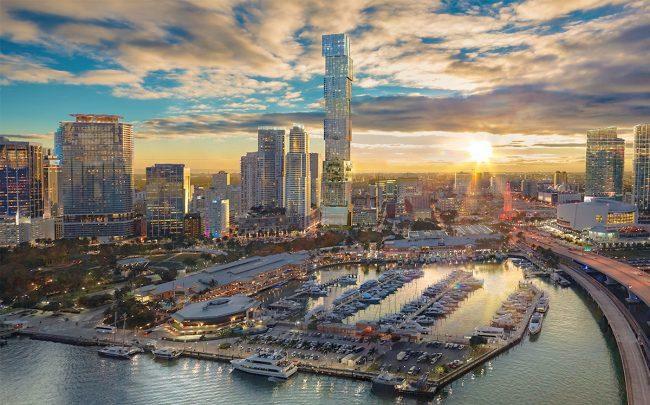 The rise in hotel construction comes as those neighborhoods experience a boom in residential development, and as major mixed-use projects like Miami Worldcenter, Brightline’s MiamiCentral and phases of the Design District get completed. It also comes amid growing competition from short-term rental companies like Airbnb. After a few slow years, Miami’s hotel market is showing slight signs of recovering. The average daily rate for hotels in the region dropped in 2016 and 2017, but rose more than 6 percent last year to nearly $200 a night, according to data from STR. Still, the question remans whether demand can keep up with supply. Hotel occupancy in the greater Miami market fell in 2015 and 2016, but has been on the rise since 2017. Yet, the growth in occupancy slowed last year, from a 1.3 percent year-over-year increase in 2017 (up to 76.5 percent occupancy) to only 0.2 percent by the end of 2018, to 76.7 percent occupancy, the data shows. Some hotel projects in the pipeline include the hotel components of condo-hotels, like YotelPad Miami and the Waldorf Astoria Hotels & Resorts, both in downtown Miami. Aria Development Group and AQARAT recently started construction of YotelPad, a 31-story tower with 231 condos and 222 Yotel “cabins,” or small hotel rooms, at 227 Northeast Second Street. The Waldorf project has not yet broken ground. The Miami market also has two major convention center hotels planned: an 800-key hotel next to the Miami Beach Convention Center and a 1,700 room hotel at Miami Worldcenter. Correction: An earlier version of this story used previous condo and hotel room figures for YotelPad Miami.